I have mixed feelings about Wednesdays, especially this week. Sometimes I’m celebrating that I’ve survived half the week, this week I’m feeling pretty wiped and grumbling that there’s still two more days to go thanks to being short-handed at work and being on-call this week. Today was another stressful day at work and I had a mini-meltdown when I got home because I got a work call on the drive home, pulled into my driveway to find today’s storm dumped our trashcan all over our driveway before the trash was picked up which I got to pick up in the wind and rain, my on-call work laptop locked up while trying to connect into work and help a user out, and a cat missed the catbox and peed all over the floor around it. Plus it was just too rainy and icky to run, hope the weather is better tomorrow. Thankfully hubby was a sweetheart and took care of the catbox mess, but that stress fest made it difficult to relax. 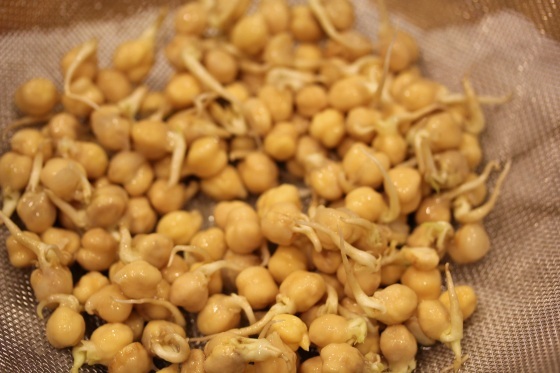 But I did have trying my latest sprouting adventure to look forward to – sprouted chickpeas. 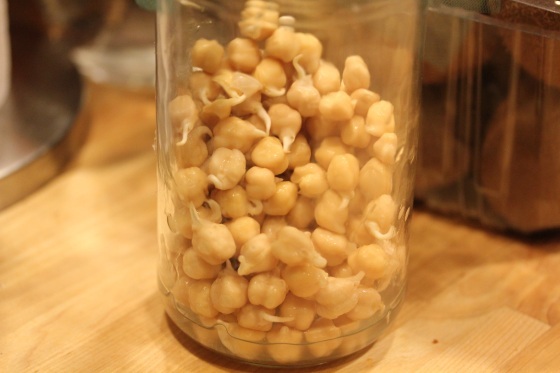 5 days ago I soaked about 1/4 cup of chickpeas for a couple of hours and set them up in a sprouting jar and rinsing twice daily. After 24 hours they were already sprouting. The getting long tails after 48 hours. After 3 days, they were starting to look ready and taking up a lot more space in the jar. After 4 days they were ready to eat, so I rinsed them and strained any extra sliminess before using is a salad. 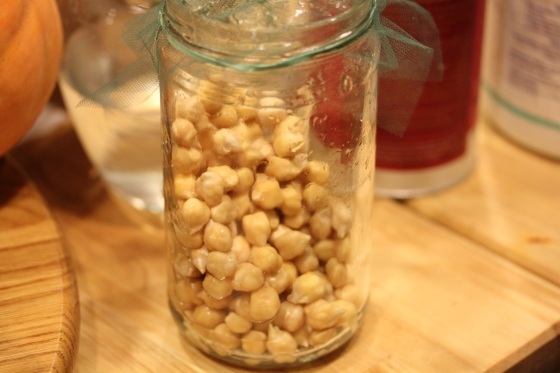 By themselves, they have a crunchy, but not too crunchy texture with a flavorful kick compared to cooked chickpeas. I also had a bunch of mini potatoes that came in last weeks farm box to use up and they just screamed stressful day comfort food to me. I wanted to try Gena’s Potato Chips, but my potatoes were too small to slice. So I did potato wedges inspired by Gena’s recipe. 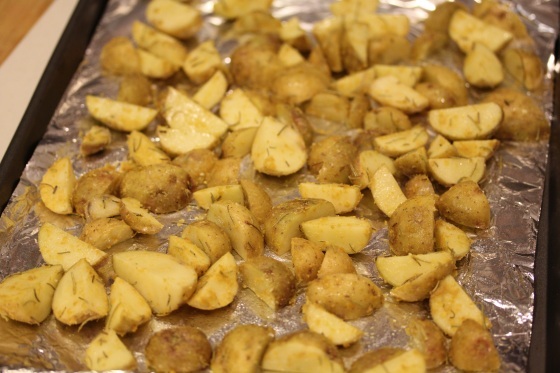 I tossed the wedges in a bowl with olive oil, dried rosemary, salt and nutritional yeast. Then spread out on a baking sheet and baked on convect at 400 degrees for 40 minutes. 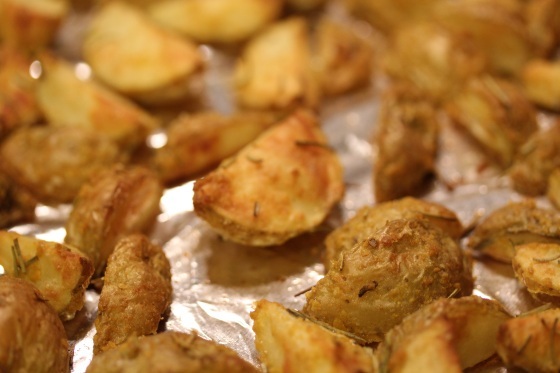 The end result was gorgeous, perfect little, crunchy golden wedges with a rosemary smell and flavor, they just made the kitchen smell so nice while baking. I served them up with my sprouted chickpea salad with sauerkraut, spinach, carrots, avocado, red cabbage and mini sweet peppers dressed with JL’s Tangy Tomato Dressing. 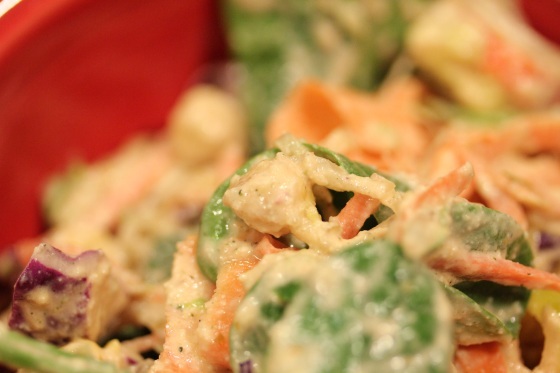 Her dressing is fabulous, tangy and rich. I used half hemp seeds and cashews for mine, but it still had a very creamy flavor that worked will with the tangy sauerkraut. 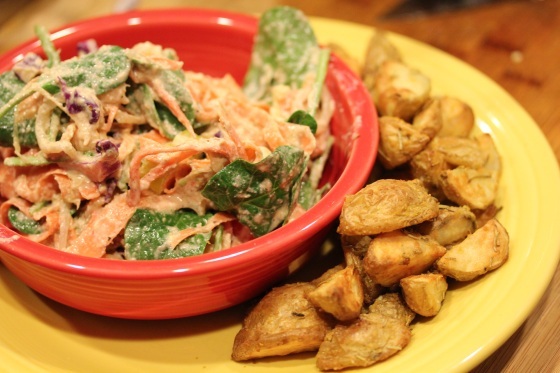 While the chickpeas added a satisfying crunch to the salad – perfect dinner after my icky start to the evening. Now I’m going to hit to gym to complete the de-stressing process. Have you ever grown your own sprouts? Also, there’s still time to enter my CSN giveaway. Ugh, that was a really crappy way to end the day! I hope your gym workout helped relieve some of the stress! I’m so glad you tried the dressing and enjoyed it! Love the idea of hemp seeds! Will definitely give that a try next time. My chickpea sprouts are on day three. I’m going to taste tonight and see if they are read for a little experiment! hehe My buckwheat groats sprouted quickly, 36 hours, so I need to something with them, too. You really got me going on the sprouting and I’m really appreciative. Having sprouted beans and grains handy has really helped keep my diet higher raw. So thanks for that! Hemp seeds are interchangeable with cashews for a lot of recipes so I’ll usually swap to mix up my food intake and get a little more protein. ahhhh so fun! so tell me more! What type of lid/covering do you need on the jar? rinsing just twice a day? thats it? I totally want to do this once I figure out the rest of the details from ya! =) yay!!!!! Just soak the beans in water for 4-8 hours, drain and rinse them twice a day by filling the jar with water and draining it. In 4 days, they should be ready to eat. is the hand really that creepy?! just wait until i get more… now that will be horrifying. the hubs will never sleep. i think the pink glitter makes it a little less terrifying. haha. Oh, a pink glitter one would be awesome! The sprouted chickpea salad looks so so so so so amazing! I seriously would love to come to your house and have a dinner girls night! U make the most yummy things! Love ya girl! Thanks for the comment on my wedding invites! Im glad you think they are pretty!!! yuuuuummmmm. omg. that looks ah-mazing. so good. i’ve been vegan for a little over a year, but raw foods still sort of intimidate me. this looks so delicous. I just sprouted chickpeas this week too! I used some of them for hummus—and it was good, slightly different than regular. I also dried some of the chickpeas, and ground them into flour today—so they can morph into a socca tomorrow. Yum, I’m gonna try my next batch in hummus, that sounds wonderful! ah, sorry about your day! what a thing to come home to!!! 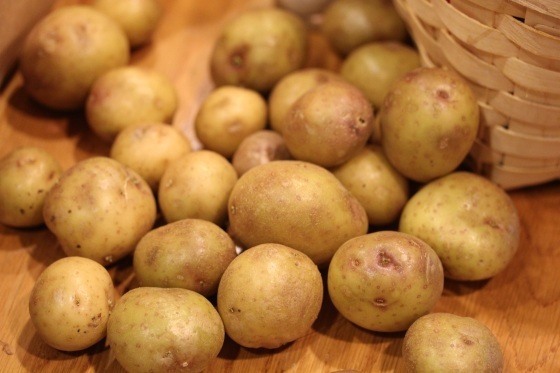 but those potatoes look great! 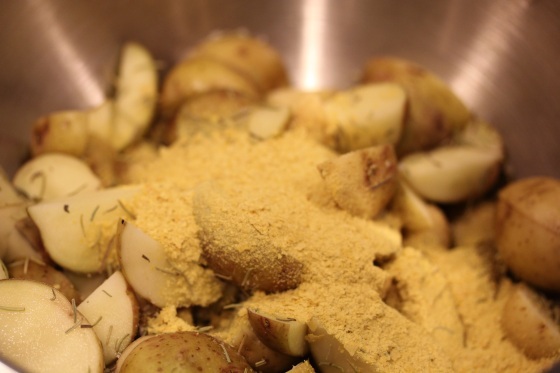 i just got my nutritional yeast and made potatoes tonight…before i read your post! dangit! next time! 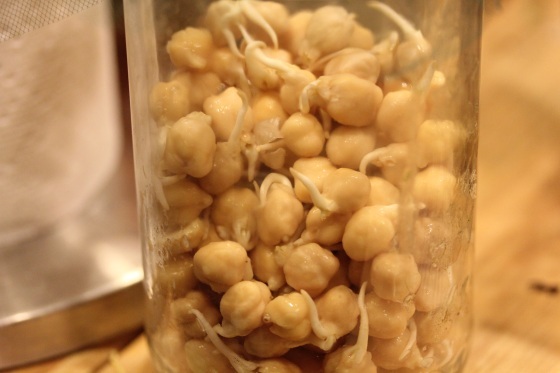 that is SO COOL that the chickpeas just….GREW like that. That fast! I have a sprouting tray that I was sent and I need to unwrap it…and get busy. 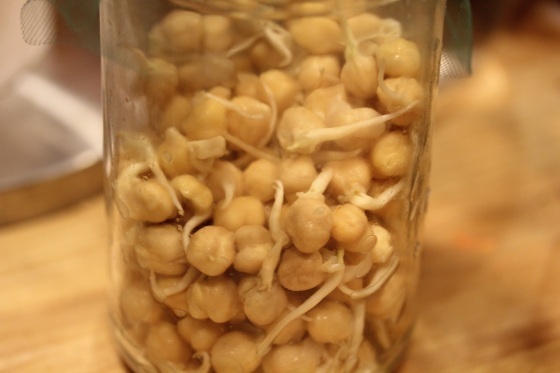 Do you like lentils or chickpeas better when sprouted? Guess i should try them both!